LDW is fundamentally a data management architecture for analytics that extends over multiple data repositories of different types in multiple physical locations – in the data center, in remote sites, and in the cloud. These data repositories often include traditional data warehouses, Hadoop-based data stores, transactional data stores, content management systems, cloud-based data, columnar, in-memory data, NoSQL databases and streaming data (both structured and unstructured). The LDW sits between these and the machine learning, business intelligence and advanced AI systems that extract the value from this data, shielding them from the underlying complexity and allowing them to treat all of them together as a single massive data store. However, enterprises are finding that actually creating an LDW is a complex, multifaceted problem due to the lack of standard interfaces for data discovery, access, security, governance, and ILM. These are massive challenges for any IT team charged with creating an LDW from the ground up. Fortunately, it’s not anymore. 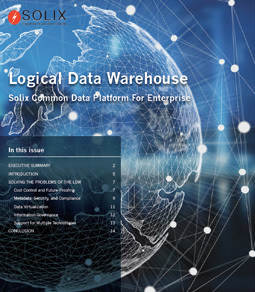 Solix provides the answers to these problems through what is essentially a fully constructed and updated LDW, the Solix Common Data Platform. Fill the form on the right and download our paper to learn how Solix can help you build a modern LDW that is future proof.